It all began in the 1880's when Joseph Schartner and his brother Julius left the Hamlet of Scharten to embark upon a new life in America. Each brother settled on a different Schartner farm, growing fruits, vegetables, and apples. The second generation of Schartners moved to Rhode Island in the 1920's and rented the land on Rt. 2 in Exeter. Here they started a dairy and milk delivery. The second generation of Schartners started an amusement park called Schartner's Kiddyland close by, which was one of the largest in the area. The amusement park flourished until the Colonel Rodman Hwy was built and the beach traffic dwindled, which caused the Schartners to close the park. 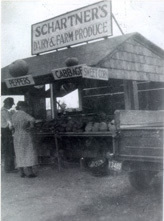 After the close of the park, the Schartners then relied on their potato crops, selling them mostly in bulk to George Greer (Wise) and Frito-Lay. It was not until 1972 when the farm invested in the roadside market, which is the retail business known today. In the last 20 years the Schartners have continued to preserve land as the farm has acquired acreage, and have come to call it Schartner Farms. Stop by Schartner Farms today and step back into a tradition that began decades ago. Whether you are looking for homemade jam, pumpkin pies, or fresh fruits and vegetables, Schartner Farms has something for everyone. Stop by and see one of Rhode Island's best and savor what's fresh from a field near you!